Now that high school is over, Ari is dying to move to the big city with his ultra-hip band―if he can just persuade his dad to let him quit his job at their struggling family bakery. Though he loved working there as a kid, Ari cannot fathom a life wasting away over rising dough and hot ovens. But while interviewing candidates for his replacement, Ari meets Hector, an easygoing guy who loves baking as much as Ari wants to escape it. As they become closer over batches of bread, love is ready to bloom . . . that is, if Ari doesn’t ruin everything. Thanks to JM @BookFreakRevelations for organising the tour, and Macmillan International and First Second Books for sending me an advance review copy in exchange for an honest review. This was gifted. Bloom centres around Ari, a queer teen of Greek descent, and Hector, a black, queer teen, who moves to Ari’s town for the summer to clear out his late Grandmother’s home. Ari begins the story despondent and frustrated because he feels his father is holding him back, rather than encouraging him to pursue his dreams. He’s fallen out of love with baking and posts a job ad for someone to replace him. Hector, who’s been in town for a short while when he sees the ad, loves baking and jumps at the chance to work in a bakery. Despite having very different personalities, the two bond over baking. Although Ari sees Hector as something of a rival at first (Ari what are you doing, *you* were the one to post the job ad! ), Hector’s warmth and kindness quickly break down Ari’s barriers. One of the reasons I loved this graphic novel so much is that it includes a trope I really enjoy. Friends-to-lovers. After spending so much time together in the bakery, Ari and Hector realise that they have romantic feelings for each other and decide to act on them. Their blossoming romance is incredibly soft and sweet, and some of my favourite scenes were the ones where they were being cute and couple-y together. The plot is easy to follow and we’re treated to some incredible funny scenes along the way. The scenes where the other applicants interviewed for the baking role, had me laughing out loud, and Hanna has exceptional comedic timing. Her quips and quirks made her one of my favourite characters almost instantly. In fact, all the secondary characters were well-developed and writer Kevin Panetta strikes the perfect balance between focusing on the main characters, and cultivating the secondary characters too. One thing I can’t get over is how beautiful the artwork is in Bloom. The colour scheme is masterful and the two-tone blues give everything a gentle, hopeful feel. The blues also really lend themselves to the nighttime scenes, which are gorgeously drawn and coloured. The clean lines and vivid expressions make each character completely unique, and the backgrounds are so realistic and immersive that it’s easy to imagine ourselves alongside the characters, experiencing everything with them. Artist Savanna Ganucheau adorns all the scenes where Ari and Hector are baking with flowers, which is a nice nod to the graphic novel’s title. 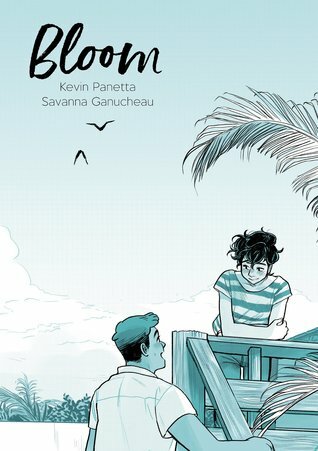 Bloom is one of the best graphic novel’s I’ve read in a long time. The art style, plot, and character development are all skillfully rendered and combine to create a wonderful story. Ari and Hector’s romance is incredibly sweet and heart-warming, and the messages of family, friendship, and figuring out what you want in life and will stay with you long after you’ve finished reading. The artwork in Bloom is so beautiful that it inspired me to create a mood board of my own. Don’t forget to check out the rest of the blog tour! You can find links to the other posts over on JM’s blog. Have you read Bloom or are you planning to pick it up? Are there any other graphic novels you’ve read and enjoyed recently? This sounds really good! There’s something about the colours that made me think of Blankets x Craig Thompson. I wanted to read this book already but this review just made it worst. It’s like, TAKE MY MONEY! I will definitely be getting it.